It is interesting to note, parenthetically, that many Napa Cabernet producers claim their wines are best after 5 or 10 years, yet they choose to sell most (if not all) of their production exclusively to restaurants. Since the life span of most restaurants is a year or two or three, some vintners might want to rethink this notion of making firmly structured wines which are immature until their fifth or tenth year when they target an audience which has the idea "dinner is tonight!" 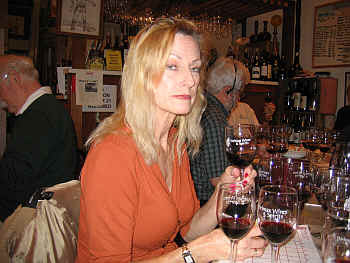 We selected a nice range of wines, predominantly from Napa with one from Sonoma's Alexander Valley. Prices ranged from $50 to $150 for a single bottle. One wine finished a bit ahead of the pack. 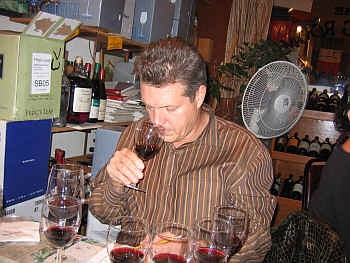 One wine had not even one first or second place vote, while five of the eight wines had top rankings from some tasters as well as last place rankings from others. The wines, as a group, were nice. I found the prices, as I often do, to be on the high side given the overall quality of the wines. 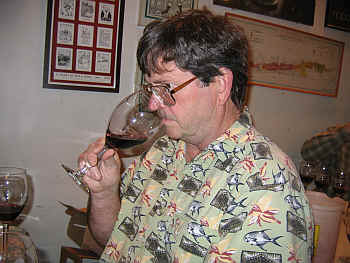 Bob Gorman suggested the reputation of the vintage may be partly responsible for the ambitious price tags. More power to these estates if they find a following for perfectly "nice" wines at top-of-the-market prices. In discussing the wines afterwards, few people had any enthusiasm for spending money on these wines at these lofty prices. The "scarcity tax" is simply too high. There was some debate as to whether or not this bottle was "corked." One critic declared it to be in such a state, while someone else described it as "Perfect, full, lush and velvety." Another taster found "dark cherry fruit," while one critic encountered "a bit of wet cardboard." I found a color intensity level which was a shade lighter than most of the wines in this flight. The nose showed faintly cedary tones with an herbal element I recall finding in Bosch bottlings from the 1970s. 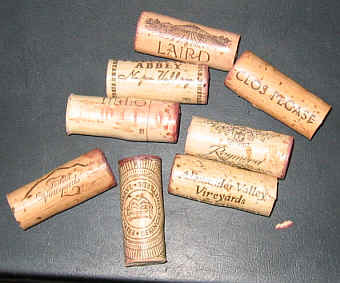 I wondered if the wine was, in fact, corked or if it had been aged in older cooperage which was not in tip-top condition. Not having experience with other bottles of this vintage makes this difficult to assess. I thought the cellar notes seemed to blow off, however. The wine is a good expression of Napa Cabernet, though it's a bit "rustic" in a certain way and might be described as "an old-time classic." It's a pleasant, medium-weight Cabernet. In a world of wines-on-steroids, this is not one. I'd give this bottle a one-half star rating, but even if in perfect condition, it's not receiving a notation above one star on my three star scale, no stars being a standard or ordinary wine. This tiny production wine (a mere 350 cases) was one which described by one critic as "having a lot of sweet raspberry fruit but the really sour nature of the wine, with its astringent tannins, did not mesh well." A second person detected "sweet and floral notes." Someone else felt the "fruit notes were on the decline and of moderate intensity. It's not a particularly cellar-worthy wine." A fourth critic noted "cassis elements here, but it lacked complexity. Perhaps the wine is presently in a state of transition and maybe three to five years of cellaring will yield a more satisfying result." A medium-ruby colored wine, this also struck me as an "old style" California Cabernet. I encountered lots of red fruit notes and a mildly cherryish character on the nose. Oak is in the background here. I was reminded a bit of old, (good) bottles of Louis M. Martini or Charles Krug Cabernets from the late 1960s and early 1970s. Perhaps this wine has a shade more structure and backbone than many of those, (though those tended to age very handsomely without the extreme tannin, oak and alcohol more common to today's wines). I liked the cassis-like fruit and found a wine capable of cellaring for another 6 to 12 years. I gave this a one star rating. Too bad the scarcity tax is so high here. 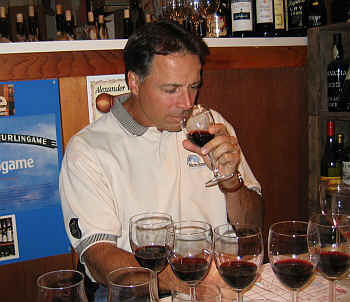 Only a few people voiced an opinion about Raymond's deluxe bottling of Cabernet. One person described it as "unbalanced and it has a very astringent finish." This sentiment was echoed by another critic who described it as having "an aggressive bite." A final taster found this to be "light and watery." Displaying a medium-intensity ruby color, I found a pleasant, creamy aspect to the fragrance of this wine. It shows sweet vanillin notes and a hint of mocha on the nose. It's a medium-bodied Cabernet with fairly aggressive tannins, marring the charming aspect of the wine. The tannins are really mouth-drying and seem to be too plentiful for the level of fruit. I pegged this as having 5 to 15 years' worth of tannin, but not that same level of fruit intensity. I still gave this a one star rating as it does have some positive character. Cellaring this may be risky, but it will be interesting to see if this blossoms into a balanced, mature wine one day. One star. This wine had many tasters ranking it highly, but a similar number dropped it to 6th, 7th or last place. One critic said "This has all sorts of sweet raspberry fruit but it's tannic and sour." 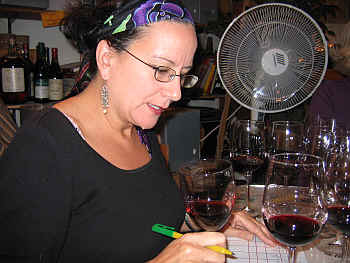 One panel member found "a chemical finish and moderate tannins." Another person found it "curiously reminiscent of pomegranate on the nose, but it's rather shrill and sharp on the palate." A fan found "Sweet fruit and not cloying or jammy. It's got a long finish and shows notes of earth and pencil. It's a big wine, but not a fumbling or clumsy one." 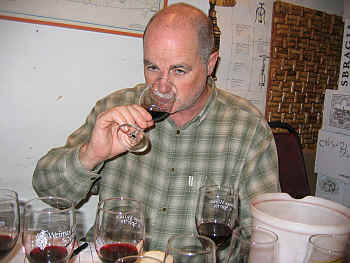 With medium-full ruby color, the nose of the Laird wine showed lots of licorice and some dusty tones. I found dark fruits and blackberry and currants on the nose. For my taste, this was a wine which was nicely balanced with respect to fruit and oak as well as fruit and tannin. It shows nice oak on the palate and black fruits, currants and cedar tones. It's probably going to be capable of aging for 6 to 12 years. This charming aspect vaulted this ahead of other wines, though I awarded it one-and-a-half stars. 4th Place: ALEXANDER VALLEY VINEYARDS 2001 Alexander Valley "Cyrus"
Five tasters ranked this reserve bottling highly, but three critics kept this wine from achieving greater glory in this tasting. One person encountered "An elegant wine with lots of fig notes and currants." Someone else said it "has a bigger nose than the other wines." A third taster found "good oak and plenty of fruit and structure." Bob Gorman mentioned finding "sweet coconut elements from the American oak and this masked the fruit. There's a bit of wood tannin here, too. One critic noted "I liked this to start, but it fell off over the course of the tasting." Someone else found it "Very hot and burning from acidity." A different perspective was expressed by another critic who found this "well-balanced with moderate tannins and it ought to age quite handsomely." Someone else described this as a "Nicely oaked Cabernet, with spice tones and a trace of menthol. It starts nicely, but this is a wine 'in transition' and should continue to develop and round out nicely. I was enchanted by this wine from the start. Medium+ ruby color, this shows a nicely cedary tone and a brushy element on the nose with currants and black cherry fruit. The oak is mild. Medium-bodied, the same dark fruit elements are found on the palate with firm tannins as it's well-structured. Lots of nice dark cherry and woodsy flavors, I suspect this may age well for 8 to 15 years. One-and-a-half stars. "I loved this!" exclaimed one tasting participant, adding "It's got good, sweet oak and is complex and rich. I found notes of nutmeg spice here, too." Someone else stated "I thought this was a Bordeaux ringer as it's so much like a good French wine." Another person said "This tasted a bit sweet and it's showing hints of Brettanomyces." Bob Gorman said "As a Brett lover, this has just a soupon of Brett. It shows the complexity added by a note of Brett. Brett at its best." While Bob and others liked the wine for its note of Brettanomyces, I marked this down for the same quality. It's a dark ruby ruby colored wine, with lightly leathery tones which hint at the wine having Brettanomyces. I also found some herbal tones on the nose and a woodsy, brushy element. The flavors head in the direction of anise or fennel, with a whiff of wood. It's a good quality, standard bottle of Cabernet. I found about five to eight years of cellaring potential here. Not being a fan of Brett, I gave this a one-half star rating. One critic found this to show a "minty character," while someone else said it's "sour." A fan described this as "Smooth and about as good a wine as I've tasted." Someone else said "This came up in my rankings over the course of the tasting. It's well-structured." Another panel member found "Blackberry fruit," while someone else also found "fennel and raspberry." One taster pegged this as having the "most complexity of any of these Cabernets and it's focused, with a great blackberryish finish." A final critic mentioned finding "good fruit and this is well-structured with good tannins and acidity." Medium+ ruby color, the Trefethen Cabernet shows some mildly dusty notes and a hint of cedary, woodsy tones on the nose. It's fairly full-bodied with brushy and charry notes on the palate. Plenty of dark fruit flavors and moderate tannins make for a nicely balanced bottle. It can cellar for another 8 to 12 years. Fine. One star.